Although I was traveling alone, I did notice that most all spaces in the room, especially in the bath room was more than acceptable for a handicapped person like my wife who is wheelchair bound. Great job. Staff on each shift at the front desk were helpful as we complained about the guests in the room next to ours, who were yelling and screaming at 6pm and at 4am! When we checked out the staff member gave us a full refund due to our terrible experience. The stairs on the entrance was a little bit dirty. It was a very convenient location for us. It was comfortable and clean. Everything was clean, staff was good and helpful. 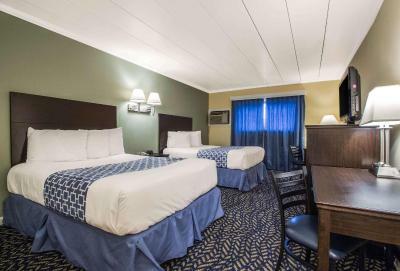 Econo Lodge Hicksville This rating is a reflection of how the property compares to the industry standard when it comes to price, facilities and services available. It's based on a self-evaluation by the property. Use this rating to help choose your stay! This New York Long Island hotel is a 12-minute drive from Jones Beach State Park and the Atlantic Ocean. 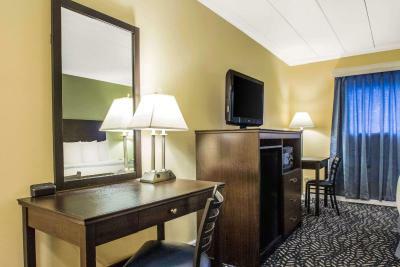 It serves continental breakfast and offers guest rooms with free Wi-Fi. 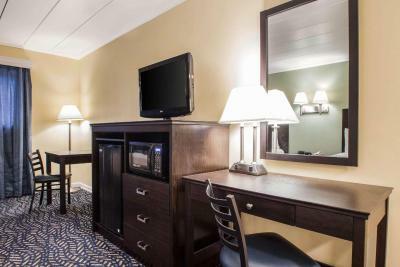 Each room at Econo Lodge Hicksville features a microwave and refrigerator. Cable TV and a seating area are also provided. 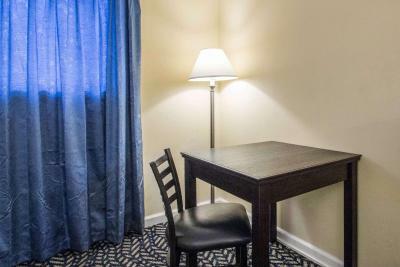 For guests’ convenience, the hotel offers a 24-hour front desk and safety deposit box. Valet dry cleaning is available, as are fax and photocopying services. Nassau Veterans Memorial Coliseum and Mitchel Air Force Base are within 5 miles of Hicksville Econo Lodge. Adventureland Amusement Park is 8 miles away. This property also has one of the top-rated locations in Hicksville! Guests are happier about it compared to other properties in the area. This property is also rated for the best value in Hicksville! Guests are getting more for their money when compared to other properties in this city. 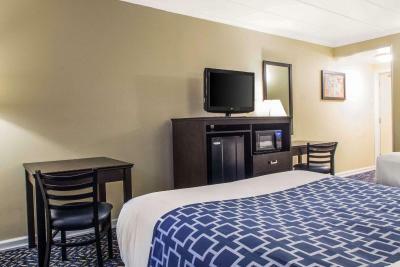 When would you like to stay at Econo Lodge Hicksville? A cable TV, refrigerator and microwave are included in this air-conditioned room. House Rules Econo Lodge Hicksville takes special requests – add in the next step! Econo Lodge Hicksville accepts these cards and reserves the right to temporarily hold an amount prior to arrival. Please note: there is no elevator at this 3-story property. All guest must be 21 years of age and show valid photo ID and credit card upon check-in. The loudness of the heat/ac unit. The rooms were very clean and comfortable. Nothing, only one comment, there should be a towel holder closer to the tub. This would make it easier to grab one as you get out of the shower. The bathroom was very very small. The shower curtain did not keep the water from going all over the floor of the bathroom. This happened to both my daughter and I and we tried to be careful. Consequently, we had to ask for more towels because we had to use our towels to mop up the floor, which the staff gladly provided. The walls let noise in from other rooms. The beds were a little soft and I would have liked bigger pillows. The price was good; much better than other places. It was convenient to get to, the staff was nice and they provided take out menus for food. The room was clean. Walls were very thin, although we would have been able to hear the people in the next room regardless, since they were very rude and had no regard for anyone else in the area where their room was. The bed was very comfy for a hotel bed. The only issue was the loud heating unit that cycled on and off during the night, which bothered some of us. We left NY with bed bugs from this place..